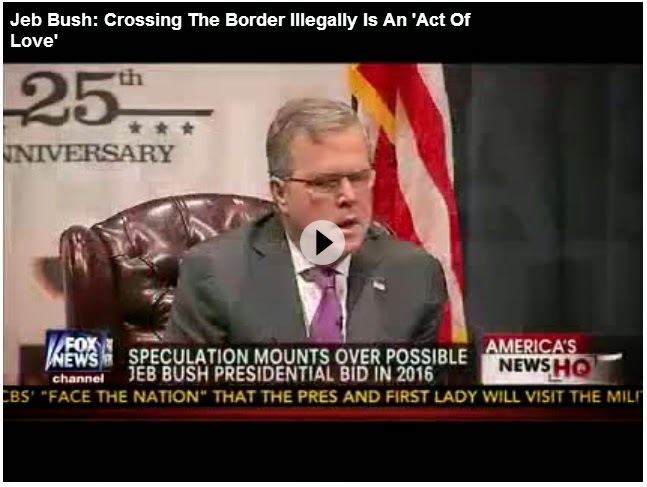 Bluegrass Pundit: RINO Jeb Bush: Coming here illegally is an "Act of Love"
RINO Jeb Bush: Coming here illegally is an "Act of Love"
"I'm going to say this and it will be on tape, and so be it. The way I look at this is someone who comes to our country because they couldn't come legally, they come to our country because their family's dad who loves their children was worried that their children didn't have food on the table, and they wanted to make sure their family was intact. And they crossed the border because they had no other means to work to be able to provide for their family. Yes, they broke the law, but it's not a felony. it's kind of -- it's a -- it's an act of love. It's an act of commitment to your family. I honestly think that's a different kind of crime that should be, there should be a price paid, but it shouldn't be -- it shouldn't rile people up that people are actually coming to this country to provide for their families. And the idea that we're not going to fix this but with with comprehensive reform ends up trapping these people, when they could make a great contribution for their own their families but also for us. " What an ideiot.....illegal means it's NOT according to law.